NEHA has been training professionals in food safety since 1937 as part of the knowledge and skills required of Registered Environmental Health Specialists/Registered Sanitarians (REHS/RS). NEHA’s well-grounded history in food safety means our standards are high and that individuals with a NEHA credential have mastered a body of knowledge and acquired practical experience to perform relevant work responsibilities. As an impartial, third-party endorsement of an individual’s professional knowledge and experience, a credential stands in support of a candidate’s resume and professional references. It serves as verification that a professional has achieved a baseline level of competency in his or her subject matter. Food safety professionals must understand local, state, national, and global regulations that affect their facility operations. The benefit of obtaining a nationally recognized credential is the transferability across state lines, and the requirement for continuing education to maintain the credential ensures that the professional is up-to-date on the most recent changes affecting the industry. The Food Safety Modernization Act has recast the food safety landscape adding to the arsenal of required knowledge for those involved in any aspect of the food supply chain. The National Environmental Health Association’s (NEHA’s) Certified in Comprehensive Food Safety (CCFS) credential is a mark of distinction for more seasoned food safety professionals who aim to demonstrate expertise in the manufacturing and processing areas, whether in a regulatory/oversight role or in a food safety management or compliance position within the private sector. 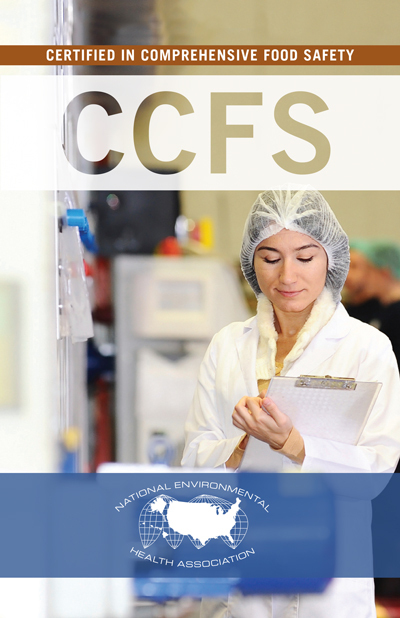 Upon successfully passing the exam, the CCFS credential holder is prepared to manage and evaluate food safety plans in food manufacturing and processing facilities to assure a safe food supply for consumers. They are accomplished in understanding and implementing preventative controls, conducting risk assessments, observing and training staff, assessing the physical facility, and assuring corrective measures are applied to control hazards and prevent foodborne illness. With today’s complex global food supply, ensuring the safety of the supply chain requires collaboration between retail, manufacturing, and food service distribution companies, as well as others. NEHA’s involvement with policy and these types of collaborations in the food industry occurs on many levels and ensures that the food safety credentials it offers serves professionals who work in a variety of settings, is relevant to their jobs, and remains current to keep pace with frequent changes in the industry. "A CCFS credential is a mark of distinction for more seasoned food safety professionals who aim to demonstrate expertise in the manufacturing and processing areas." "The benefit of obtaining a nationally recognized credential is the transferability across state lines and the requirement for ongoing continuing education hours." "I have been able to participate in a variety of projects as an SME and project leader because of the CCFS credential." "I would highly recommend the CCFS credential to anyone looking to elevate their resumé or simply wishing to tackle a new challenge"